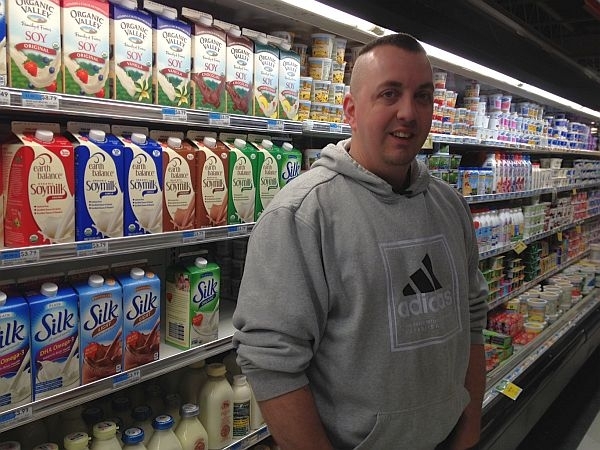 (Host) A few well-known dairy and soybean products will soon be unavailable at food stores run by the Hanover Consumer Cooperative in the Upper Valley. The Co-op says that Horizon milk, Land-O-Lakes cream, and Silk Soy milk will no longer be stocked because the agribusiness that distributes those products has unethical business practices. VPR’s Charlotte Albright has the story. (Albright) Rosemary Fifield, the co-op’s director of education and member services, has kept a wary eye on Dean Foods, especially Silk soy milk, for years now. About a decade ago, she says, the Texas-based company drew flak for importing soybeans from China. In 2009, Dean resumed buying from American farmers. But in the process, it switched from organic to non-organic beans. Fifield says the UPC codes did not change, and that the label switch was easy to miss. (Fifield) "You don’t notice that one small word change, which was the word organic, was changed to ‘natural’ on the packaging." (Albright) Organic products need to meet federal standards. So-called "natural" products do not. Fifield also questions the way the company’s subsidiary treats cows. (Fifield) "Yes, they can go outdoors. They may or may not actually go outdoors. And when they get out there, what do they find? And if you look at some of the photos of some of the Horizon organic farms in Idaho or Maryland, you’ll see that the pastures are pretty bare or they may be down to dirt, or where there are green pastures there are no cows out in them." (Albright) And Fifield objects to the low prices she says Dean Foods pays to farmers. Dean Foods has settled a large class-action lawsuit brought by farmers’ co-ops related to the price it pays for milk. Its subsidiary, White Wave, distributes the Horizon and Silk brands. White Wave spokeswoman Sara Loveday apologizes for the label switch on Silk soy milk, but defends the way Horizon farmers and cows are treated. (Loveday) "For Horizon Organic we actually purchase 93 percent of our milk from 600 family farmers across the country and 80 farmers from New England. And the majority of our farms actually have less than 100 cows. And regardless of the size of the farm, we really, truly believe in the utmost in animal welfare and really believe that each farm, whether we operate it or it’s a family farmer, has a strong pasture plan and all of those animals do pasture and meet the requirements and beyond." (Albright) And Loveday says on February first, Horizon raised the price paid to farmers by two dollars, bringing it to, on average, about $30 per hundredweight. Strolling the dairy aisle in the Hanover Co-op, Mariah Whitfield and her mother, Donnamarie, are surprised to hear that their favorite soy milk will no longer be stocked when current supplies run out. (Donnamarie and Mariah Whitfield) "At all? Why?" (Albright) Mariah says Silk Vanilla is her favorite brand. But even though she doesn’t drink cow’s milk, she says she would boycott White Wave-including soy milk, if the co-op’s complaints are valid. (Mariah Whitfield) "Then, that would make a difference, as well. And I might try to find a company that doesn’t do that and try their product and see if I can convert to it." (Albright) Her mother says she would make the switch as long as the substitutes tasted good and weren’t any more expensive. The co-op’s dairy products buyer, Pat Neily, says competitors for Horizon and Silk brands are more local and include Stonyfield, Organic Valley, Strafford Organic Creamery, and Earth Balance. (Neily) "In all cases the price to the consumer is going to be less." (Albright) City Market in Burlington is still selling Dean Foods products but says Silk and Horizon brands are losing popularity. Hunger Mountain Co-op says it is evaluating the situation after meeting in Montpelier this week with company representatives.